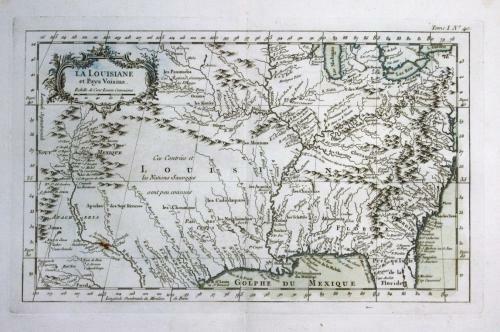 Title: 'La Louisiane et Pays Voisins" a rare original handcolored engraved map by Bellin from his Petit Atlas Maritime from 1764. This is a more detailed map than the more commonly found later Bellin map of this area (it also has a slightly wider geographical coverage). In very good condition with only a small rust stain, the cartouche is very slightly toned.